More than 400 delegates from 120 countries met at Nova SBE Campus, Cascais, turning Portugal into a global hub for start-ups and digital innovators on the subject of “Purpose driven digital Innovation.” 82 international jury members have selected 9 Global Champions 2019 from the 45 WSA winners 2018, awarded by the City of Cascais, the Republic of Austria and UN-representatives at the festive Gala on March 13 at the WSA Global Congress in Cascais. Many people are suffering because they don’t have a chance to health treatment or have access to information, while the industrialised society lacks the integrity to include and empower. The impact is vital in the sense of the word. Digital Content is bringing knowledge to places where it has not been yet, it integrates and enables. A social benefit, sustainable impact, global diversity, and digital innovation were the core themes of the WSA Global Congress 2019 – and the Global Champions. The 3-day congress showed how concern and distress give rise to innovative solutions, and how need can foster invention and sustainable design. The Nova SBE campus became a hub for unique knowledge exchange with 400 participants and outstanding international best practices of digital innovation with impact on society and mentors for 3 days. Based on the UN goals for a true information society (UN WSIS) and the UN Sustainable Development Goals (UN SDGs), 82 international jurors selected the 9 WSA Global Champions from Kenya to Pakistan, based on their presentation at the Congress and their social and local impact from the 45 WSA winner projects – with Africa making a strong showcase of innovation. The outstanding digital innovations were honoured at the festive Gala ceremony on March 13th. The winner in the Government & Citizen Engagement category was Chaos AI from Finland, an innovative team providing a multi-stakeholder decision tool for estate planning based on AI – making estates focused on the inhabitants and environmental protection. “Pakistani girls have few alternatives in getting this information Getting female health information from a trusted source is crucial all over the world to reduce female and child mortality and empower women.” a Jury member pointed out, as to why Global Learning & Education champion AI chatbot Raaji from Pakistanwas awarded. AFROCOMIX from Ghana won the Championship for Culture & Tourism, benefitting the lives of multiple creators of African Culture with a monetization platform, “…telling African Stories – and these stories need to be told to present African heroes”, the Jury states. 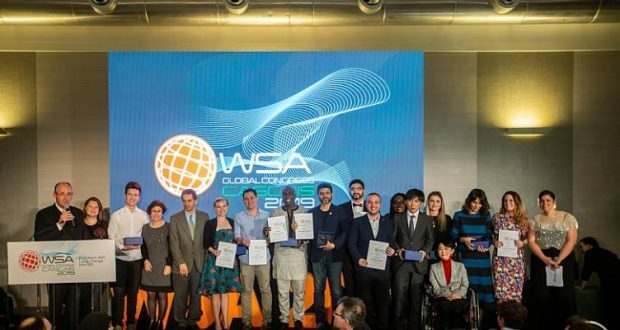 The highly competent WSA Young Innovators Global Champions LEAF from the USA proved that fintech can serve the most vulnerable of all, refugees and the stateless, who are provided with a blockchain technology to preserve and transfer their money through digital currency – across borders. The World Summit Award (WSA) was founded in 2003 by Austria as part of the UN World Summit on Information Society as a global initiative to award local digital content with high social value and presents it worldwide. Through close cooperation with the United Nations agencies and strategic alignment with the UN SDGs, the WSA is a globally recognized quality seal for digital innovation.